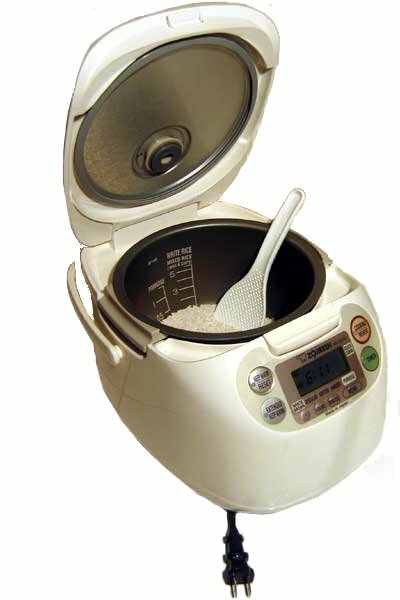 I use a rice cooker like the one shown below to cook dried mung beans and red beans (Adzuki beans) as well as rice of course. After boiling and cooking, the rice cooker switches to a stable hot temperature to store the contents for a second meal, I suppose the idea being that bacteria don't grow readily when it's too hot. That seems to work fine for all of them, except that while the rice is still white in the morning and the red beans still red, the mung beans turn dark brown in the morning. In fact they start changing color within a few hours. It doesn't matter if I've made them fairly dry or quite wet. I cook them on different days, they are not mixed. Just the dried product and an equal or larger amount of tap water. Is it possible to understand why the mung beans turn so dark brown if they stay hot? I don't notice any big change in taste, but the color looks quite discouraging. Is there anything I can add that would prohibit the color change? Browse other questions tagged beans rice-cooker color or ask your own question.